The Early Booking Discount is valid until 31/03/2018 as followed : For the route Igoumenitsa/ Corfu to Bari and vice versa: 25% for Airplane type seats, Decks, Cars and 20% for all cabins and 15% for the route Zante/Cephalonia to Bari and vice versa. Early booking discounts are valid for limited availability. Tickets with early booking discount cannot be cancelled. 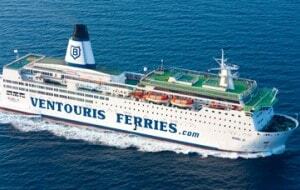 VENTOURIS FERRIES - Τhe Early Booking of Italy – Greece line from 16/04 till 30/04/2017 will be 30% for all routes. 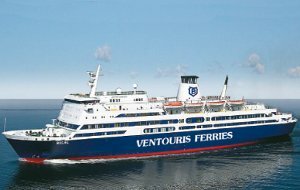 Ventouris Ferries announces that the Early Booking of Italy – Greece line from 16/04/2017 till 30/04/2017 will be 30% for all routes. VENTOURIS FERRIES - The Early Booking of Italy – Greece line from 01/04/2017 till 15/04/2017 will be 30% for all routes. The Early Booking of Italy – Greece line from 01/04/2017 till 15/04/2017 will be 30% for all routes. 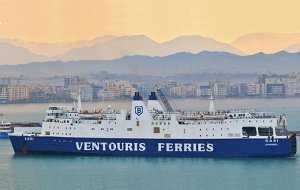 VENTOURIS FERRIES - Early Booking 30% discount of Italy – Greece line from 16/03/2017 till 31/03/2017. Ventouris Ferries announces that Early Booking discount of Italy – Greece line from 16/03/2017 till 31/03/2017 will be 30% for all routes. Η εταιρεία παρέχει ειδικές εκπτώσεις στις γραμμές Μπάρι (Ιταλία) - Κέρκυρα - Ηγουμενίτσα και Μπάρι (Ιταλία) - Σάμη - Ζάκυνθος από 21/05/2014.